Summer is still going strong! Try this refreshing watermelon pineapple punch at your next BBQ or get together. Watermelon always reminds me of summertime. My kids love snacking on the wedges and running around outside with their sticky hands. We’ve made watermelon sorbet, watermelon lemonade, and watermelon fruit punch; and this recipe packs a fresh flavor punch, sweetened by nature itself! It’s a hit at any summer party and is a healthy alternative to the artificial drinks and “fruit” juices out there. TIP: When picking a good watermelon look for the yellow splotch at one end where it sits on the ground. The yellower the better! Cut watermelon on each end so it stands on its own while you cut down and away. 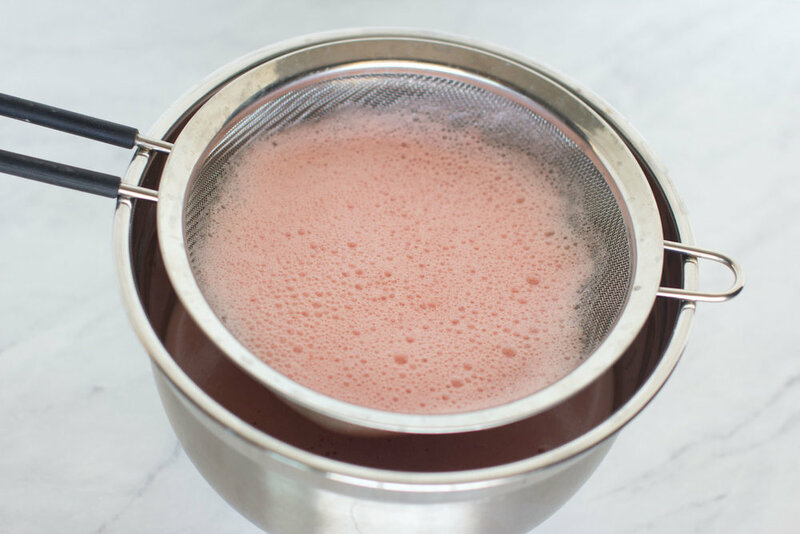 When you blend the watermelon the foam is normal; you can toss it with the chunks or let it settle on its own. Cut the top and bottom of the watermelon off about 1/6 of the way down to make sure it will stand on it’s own. Slice remaining flesh until watermelon is peeled. Cut in large chunks and place in a blender. Process until smooth. Strain through a fine mesh strainer; discard solids. Return watermelon to the blender. Add lemonade concentrate and pineapple juice and blend well. Transfer to pitcher and stir well. Served chilled in your favorite glasses over crushed ice. Garnish with a pineapple wedge, mint, or a strawberry and serve with a fun paper straw. Voila, summer in a glass!